Happy Sunday! Today is a special day in the Lit From Within house, because 17 years ago today, Mr. Lit From Within and I got hitched. I should have a hearts and flowers mani or something for today... but I created this mani a few days ago and forgot it would be going live on our anniversary. Sorry honey! I started with Brown Sparkles from Barielle. No need to adjust your screen, and no, I didn't upload the wrong picture. Why this is called Brown Sparkles, I do not know. It is maybe a teeny bit on the champagne side, even though it looks silver here. There are some sparkles, but it really just looks like a foil finish to me. I tried to get it to sparkle... It's a pretty color, but not very exciting, and nothing like its name! I decided to use China Glaze Midtown Magic and my new Cheeky plates (CH52) spiral/wave stamp for the tip. Some of the new Cheeky full-nail stamps also have a curved edge, so you can use them for tips or even half-moon manis, which is very clever, indeed! I did freehand a line at the top of the stamp just to give it more definition. I don't do a lot of French tips because my nails are short and my nail beds are small, and a tip tends to make my nails look even smaller, but I think it looks okay with this type of tip because it's more open with the filigree. Do you like a French or Funky French tip? Do you freehand, use guides, or stamp? 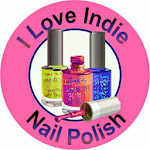 I'm guesting at Let Them Have Polish! today while Cristina gets a little R&R and feeling better. I hope you'll check out the special mani I did for her, and check out all her swatches and nail art - she's got a fantastic blog. This is the color I started out with, but you probably wouldn't recognize it in the final product... See what the final look is over at Let Them Have Polish! Daring Digits Almandine. Sigh. The moment I saw it, I wanted it! I love how it looks black around the edges, and has that lit-from-within look, but still has a greyed-out purple look, too. Hits Hephesto made it look holographic! Probably the only thing that could improve on it at all. So, of course, I dented the middle finger, because all beauty has imperfections. Who knew that Fergie could inspire some cool nail polishes? This lovely glass fleck purple is Ferguson Crest Syrah. And it goes from cool to amazeballs with 2 coats of Finger Paints Asylum! Do you like changing polish by changing topcoats? I have a bunch of blues and some different techniques to show you today! It never ceases to amaze me how so many of the Essie colors can look so similar to each other in the bottle, and sooo different on the nail. I bought this on a whim from TJ Maxx, and I love it - Smooth Sailing. Sparkle! I decided to stamp over it with Essie Nothing Else Metals, a pale lavender chrome, which actually looks more silver over Smooth Sailing. These chromes stamp divinely - I've never been able to get so much detail from a stamp before! Next up, blue HOLO! With a good cause, too. Pam from Girly Bits made two polishes with the proceeds going to the memorial of a teenager who suddenly and unexpectedly passed away. With a community left reeling, she took it upon herself to help raise funds by creating and selling Roger That and Gentle Ginger. I embellished with a few studs from the Dollar Nail Art store. You can't really tell from the picture, but the large silver studs have a ripple pattern in them. Way cool. I love using studs or stones to accessorize a holo. And, last but not least, a water marble! This is my first successful one EVER! woot! It doesn't look so great here - what a mess! I decided to try smearing lip balm on my fingers instead of using tape. It worked pretty well, but I didn't realize exactly how far up my fingers I would end up getting the nail polish! I'll confess that I did double-dip my pinky finger to see if I could fix the hack job I did the first time. I like the pattern on my thumb and ring finger best! This was soo much work. I'm not sure how often I'll be doing water marbles, but it really is a unique look. I used all SOPI colors: Tempted by Teal, Who's Spinning Tonight?, Slushied, and Cartwheels on the Catwalk. Lessons learned: Metallics are hard to clean up! Also, teals and blues stain and can also be hard to clean up. Which blue look do you like best? Ready to put on some blue? I went 'dusty hunting' at a few beauty shops in Daytona recently, and came upon two that specialized in ethnic beauty supplies. I found a couple of polish brands I'd never heard of before, and picked up one called Nanacoco. This is Neon Flux. Look how pretty it is. Shimmery, almost foil-like, opaque in one-coat. And it smelled like it had died a century ago and went to nail polish Hell. Horrible. Worse than any Kleancolor, much, much worse. I could barely breathe. I covered it up with Everybeauty Carnaval Mist, a beautiful Indie green shimmer polish with holo microglitter. I love microglitter! I love holo! Can't get enough of it. Indie sellers see me coming a mile away. After a few days, I must have forgotten the trauma of the Nanacoco, because I thought to try it again. I started with another experiment, to see if Revlon Mistletoe and Sally Hansen In a Flurry were dupes. Cousins, maybe, but not dupes. Mistletoe, on the thumb and ring finger, has a much different finish, smaller, duller glitters, and is a tad more green than In A Flurry, which leans teal. From a distance, though.. I doubt the layman would notice the difference. Not one to waste a mani, I decided to practice some dots, and thought maybe the Nanacoco polish wouldn't smell so badly if I was just using a *little* bit of it. The red is Mystic Rose, the lavender is Mystic. How bad does a polish have to smell for you not to use it? Would you franken with it? Pour it out and use the bottle? Put it in a swap or sale with a disclaimer? Toss it in the trash and be done with it? Ever get bitten by a particular color bug? When I saw these polishes by Once Upon a Polish, it didn't matter that I don't wear red or pink very often - I needed them. I started with a layer of Joe Fresh Berry. This is a new-to-me brand I got through a blog sale. I really like it! The brush is a little small, but I have small nails, so that's not a problem. I paired Berry with Once Upon A Polish Whosits and Whatsits Galore!, a clear base packed with microglitters in red, white, pink, and green. I saw this featured on another beauty blog, and immediately wanted it. It didn't disappoint! The next polish I paired with Sally Hansen Complete in Courtesan. This is only one coat, and the slight VNL wasn't that visible in real life. I love the formula and brush of SH Complete so much that I'll try almost any color of theirs I find on clearance - even a rose pink. Rapunzel is my new fave pink glitter. I don't think I've ever paired pink and gold together before, and I absolutely love it in this polish. This is so feminine and the gold is so unexpected and awesome. I also like the subtle purple square glitter. It adds depth to the polish because you can see it even though the base is pink, not clear. I love it when a new Indie delivers such winners! If you want to try Once Upon a Polish, you can find them HERE. I hope you like them as much as I do! A little break from the bold to do some 'palate cleanser' delicate manis for you. The first one is OPI DS Opulence, a dark pink scattered holo. I would love to get more of the DS line, so far every one I've tried is a winner. A dream would be to get DS Original, but I'm not paying $50 to get it. I love that it's a pretty color, but it's so complex. Probably one of the few times I just wore ONE polish. Can you tell I've been practicing my gradients? This one started with a layer of Sinful Colors Mystique, a pearl finish pale, pale lavender/grey. I used Milani 3-D holo in Hi-Res on the tips. I must have liked this mani, I did both hands! I wanted a little more shine, so I layered Different Dimension Inner Goddess over the top. I really like this glitter! It looks translucent, almost like flakies, but it's glitter. Do you like to wear pretty princess manis? I know I own too many pistachio greens. I never would have even worn this color a year ago. Now, I'm in love with it. This is Butter London Bossy Boots, a gorgeous, easy-going pistachio creme. I thought it might make good undies for the bright green of Elemental Styles Rubidium Cube. This photographed much more neon than it looked in real life. In this picture, I shaded my nails, which looks silly, but it is actually closer to the true color of the green. It's a grass-green, not neon. This was two coats, and it's almost opaque. How microglitter meshes together and the white and the green look like a solid color is such a cool effect to me. I never get tired of it! I didn't think I was going to like Pink Ribbon. It's not a color I would gravitate to, but I bought it in one of the GMA sale sets that was 50% off. Two coats and it's still very sheer, but the formula is so nice, and the color so delicate, that I would reach for this for a French mani, or 'palate cleanser' when you want a fresh, clean nail look. Elemental Styles I see London, I see Francium looks like it's going to be a bright orange from the bottle, but it surprised me with this delicate golden/apricot glitter glow. As much as I love bold colors, I didn't want to take this off. I felt like a princess! Butter London is online and at Ulta stores. Elemental Styles is on etsy HERE. I thought they went well together. What would you pair with these topcoats? 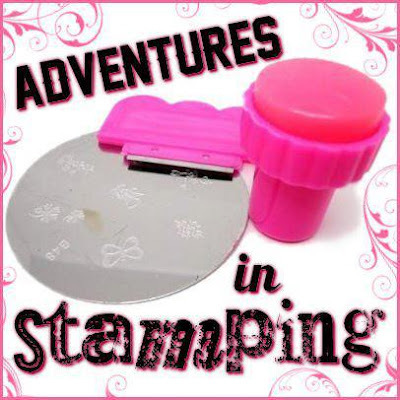 Sunday Stamping - Whoa, it's toxic!